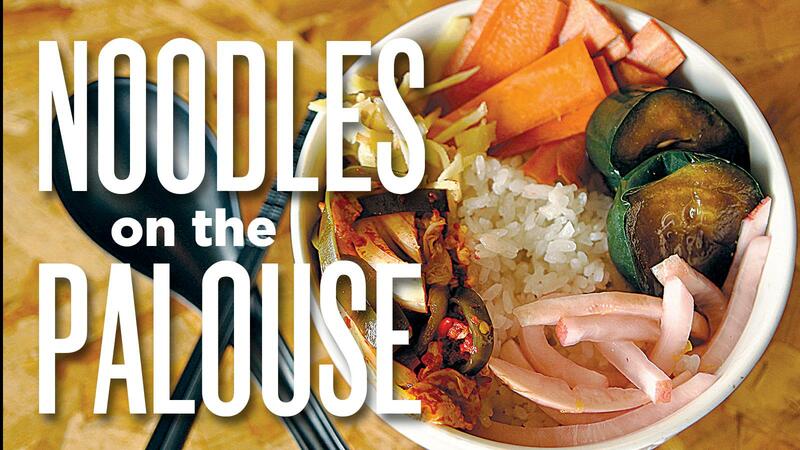 PULLMAN – Orin Ford sums up what makes good ramen in a word, without hesitation: umami. That savory richness, a meaty or mushroom-y flavor attributed to the amino acid glutamate, is often described as the “fifth taste” – in addition to sweetness, sourness, saltiness and bitterness. Ford went to Japan twice in recent years to learn to make ramen and achieve umami in the other aspect that arguably makes a good belly-warming bowl: a complex, broth that takes hours upon hours to build. Ford simmers his for 12. It doesn’t come out of a box or bag; it’s scratch-made, in-house, the way he learned while overseas. He owns the recently opened and already popular O-Ramen restaurant in downtown Pullman, where he’s been running out of bones and selling out of broth since the first day of service. The casual, walk-up-counter kind of eatery serves a streamlined menu with three soup bases: rich pork, blended chicken and pork, and garbanzo bean for a vegan option. Ford’s still working out logistics, including balancing supply and demand, special-ordering pork bones and fine-tuning recipes. He builds umami in his long-simmering soup bases with ingredients such as dried seaweed, dried fish, soy sauce and shitake mushrooms. So far, tonkotsu – with rich pork broth, pork pieces, pickled ginger, wood ear mushrooms, green onion, soy sauce, seaweed and egg – is a top-seller. So is the miso. It features the same rich pork broth, plus miso, pork, cabbage, bean sprouts, carrots, green onion and egg. And, Ford said, “I’ve been surprised about how many people comment on the vegan bowl.” It’s made with miso, cabbage, bean sprouts, carrots, garbanzo beans, bamboo shoots and green onion. Rounding out the menu are two bowls made with the blended broth: shio (with sea salt, egg, bamboo shoots, dried seaweed and green onion) and shoyu (with soy sauce, pork, egg, spinach, bamboo shoots and green onion. Plus, customers can order a basic bowl with their choice of broth, bamboo shoots and green onion. Add-ons (for $1 to $3) include pickled ginger, mushrooms, chili oil, seaweed and more. Bowls run from $8 to $13. Isaac Leidenfrost, who previously worked at Pullman’s Black Cypress restaurant, is the chef. Daisy Beam, who also comes from a Black Cypress background, is the sous chef. In all about 30 people work at O-Ramen, which encompasses about 2,000 square feet and holds 45 guests. Décor is Asian-inspired and minimalist, with clean lines and a black-and-white palette with red accents. “I wanted it to be a bright, clean space,” Ford said. He grew up in southeast Idaho and moved to Moscow to attend the University of Idaho, graduating in 2008 with a bachelor’s degree in biology. He put himself through school by working at WinCo Foods. After graduation, he worked at Moscow’s Sangria Grille, starting as a dishwasher and working his way up to prep cook then kitchen manager. He moved on to Moscow’s Maialina Pizzeria Napoletana when it opened in 2013, serving as general manager. By 2015, he was ready for a break. An eight-month backpacking trip took him through South Korea, Hong Kong and southeast Asia. The journey began and ended in Japan, where Ford took an intensive three-day ramen class outside of Osaka. It helped solidify his dream of opening a ramen shop on the Palouse and, when he returned, he began looking for space while also working as a bartender at Etsi Bravo, a night club and lounge in downtown Pullman. Ford made handcrafted cocktails for about two and a half years before finally taking over a storefront on North Grand Avenue. Renovations took four months. He wrapped the bar in bamboo, painted the walls, added trim and installed paper lanterns. He also added Japanese-style screens behind the bar, built shelves and tables, painted chairs, bought kitchen equipment and traveled back to Japan. This time, he was there five days. “I ate a bunch of ramen and went shopping in the restaurant district,” said Ford, who bought the red lanterns that hang outside O-Ramen during his latest trip. He also took another class, this time in Singapore, to brush up on his ramen-making skills. For now, he uses Sun Noodles. But, within two years, he hopes to start making his own noodles using Palouse-grown grain. And, sooner than that, he’s hoping to open for lunch as well as dinner, first on weekends and adding weekdays later. He’s already planning to add a cold ramen dish for summer, plus a hot-and-spicy composed bowl with chili oil, and dipping noodles, a dish in which the broth and noodles are served in separate bowls. Sides include edamame with sea salt and Japanese seven-spice, fried pork dumplings, pork and rice, rice with house-made, colorful quick pickles, and a “supreme” rice bowl with pork and house-made quick pickles. Look, also, for hot and cold sake, plum wine, hot tea and rotating draft beers. Whatever you order, you won’t have to wait long. Ford’s goal is for dishes to come out of the kitchen within five to seven minutes. Published: April 9, 2019, 5:44 p.m. Updated: April 9, 2019, 9:13 p.m.